Cru (Formally known as Campus Crusade for Christ) is a caring community passionate about connecting people to Jesus Christ. Finlandia University students are invited to join the Michigan Tech chapter. The next event on our campus is a Good Friday service that will be in the Chapel of St. Matthew at 6:30 p.m. on Friday, April 19. No RSVP required and alls students are invited. 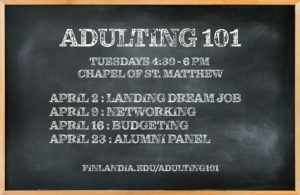 Adulting 101 Workshop - designed to help students navigate "the real world" after graduation. Four sessions in April, Tuesdays from 4:30-6pm at St. Matthew Chapel. Students encouraged to bring laptops/computers. No need to sign up, just drop in. Open to anyone who is interested. Snacks provided.